Just days after the American and British forces broke through the German defenses at Normandy, foreshadowing the end of Nazi rule over the European Continent, much of that country’s top technical personnel began to filter out of the in hopes of escaping the ever closing circle. Most were captured by the Western Allies (United States and Great Britain); others were ‘recruited’ by the Soviet Red Army, which was rapidly pushing from the East. While another group managed to slip pass the allied hands. Most of them made their way towards South American. The Republic of Argentina was one of the most prosperous one in Latin America. It had a big German population, a vast land rural region and Perodian government with a slight Nazi flavor. It also possessed one of the strongest militaries in the Western Hemisphere. With the arrival of several German engineers and technicians, the Argentines began formulating several advance new military projects. Chief among them were the AM-1 and PT-1 missiles. The AM-1, an air-to-air system codenamed Tabano, had the distinction of being South America’s first indigenous developed missile. As does the PT-1 air-to-ground platform. Spearheaded by a trio of legendary German engineers, Werner von Baumbach and Ernst and Emil Henrici, Argentina began the development of its own version of the famous Henschel Hs-293, the first operational guided air-to-ground missile in the world. Designed by Baumbach and the Henrici Bothers, and built by the Specialize Weapon Section (Seccion de Armas Especiales) of the Military Construction General Direction, a subdivision of the Gaucho Army; the Argentinean version of the 293, the PT-1, was basically a complete copy of the original. The PT-1 or Guide Missile (Projectil Teledirigido) One consisted on a 441 pound bomb warhead fitted inside a V1-type structure of 11 feet, 7 inch with a wing span of 9’10”. Total weight was 2,205 pounds. With an initial speed of 195 knots and capable of reaching speeds of 513 kts, the ‘Projectil’ had an effective 18.64 miles range. The optimum launch altitude was estimated at 22,000 feet. Operation of the system was also similar to its 293 cousin’s profile. Operation Sovereign or Operacion Soberania, the design and development of Argentina’s first air-to-surface missile system commenced in the summer of 1952, with an specially modified Douglas C-47 Dakota. The strong built transport was fitted with a ventral boom was placed through a series of high stress, aerodynamic tests. At the same time, the newly produced PT missile was extensively examined at the Fabrica Militar de Aviones (FMA) advance wind tunnel. Also at FMA, a surplus Gloster Meteor I-087 was altered to carry a ventral pod with the tail of the missile. But the most promising launching platform was the venerable Avro Lancaster B-036 heavy bomber. 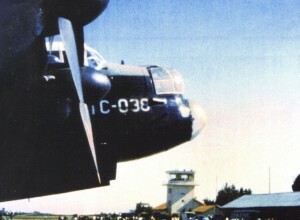 The Lancaster provided the PT with a more stable deploying system. As configured by the German engineers, the B-036 consisted of a launching rack installed below the huge bomb bay doors. On April 22nd 1953, the Lancaster replaced the Dakota as the PT’s main deploying platform. Captain Federico Muhlenber was assigned to the initial test phase. Eventually, he will be replaced later by Captain Di Pardo in that task. It was Di Pardo who will have the honor of deploying the last PT missile nearly five years later. The 036 was assigned to the 1st Air Brigade (I Brigada Aerea). The testing phase began at earnest in October 1953. Flying out of Monzon, the home base of the VII Air Brigade, Muhlenber took the Lancaster through his phases. First it was taxing and runway operations, which ran smoothly. Then, on the 6th, the aircraft took to the air for its initial flight with the PT attached to its belly. The bomber performed flawlessly that autumn morning turning and banking without much effort. Several more flights were made until the afternoon of the 20th when, flying above the Rio Plata, one of the left engines failed forcing the aircraft to plunge near Quilmes, a suburb of Buenos Aires. Von Baumbach, Ernst Henrici and a mechanic die in the accident. The aircraft and the missile were also lost. After the tragedy, the Argentines when back at work on another altered Lancaster, tail sign B-037. As the same time work was done on preparing the new plane, the design team slightly altered the configuration of the original Projectil. The improve platform was called PAT-1. The only variant from the original was a larger fuel tank which gave the missile a top operational range of up to 30km. The first recorded launch of the PAT system occurred in late November 1954 at the General Soler firing range. Flying at 15,000’, the 037 entered a dive, a few seconds later Latin America’s first air-to-surface missile was released. Work on the system continued until September 17th 1955, when the government decided to introduce it as part of their efforts to stem the tide of the rebel forces in the country’s Revolucion Libertadora. The first target of the PAT-1 was to be the Pajas Blanco Airport at Cordoba. But before the Lancaster B-037 was able to take off, an incoming rebel Lincoln aircraft bombed the Monzon base destroying the sole aircraft capable of firing the PAT platform. By 1956 the air force had modified another Lancaster, B-043 and testing resumed at El Palomar Air Force Base at the outskirts of the River Plate. The first launch took place in the morning of October 5th. A second test was performed on the 18th. Several other deployments took place between the 19th and 21st. On the 22nd, while on taking off, the 043 suffered a small fire forcing the pilot to abort the test mission.